Figure 1. Pigmented rash involving both groins and perineum. Figure 2. Stratum corneum containing numerous small rod organisms distributed as ‘Chinese letters’. Over an eight-month period, a 54-year-old man noted an irritable, pigmented, slightly scaly rash confined to his groins and perineal area (Figure 1). Hyperpigmentation of the groins may be due to a number of processes. Postinflammatory hyperpigmentation may be localised to the groins. This often has an ashy blue–black appearance and may follow in the wake of inflammatory processes, such as dermatitis or psoriasis in individuals with dark skin. Acanthosis nigricans presents in the flexural areas, including the groins, as a velvety grey–brown pigment. Skin biopsy reveals epidermal papillomatosis with increased keratin over the surface and normal melanin pigment. Investigations may reveal insulin resistance. More rarely, acanthosis nigricans may be a paraneoplastic reaction as a sign particularly of gastric carcinoma and can be associated with eruptive seborrhoeic keratoses. Amyloidosis may rarely develop in the perianal and flexural areas. This appears as rippled pigmentation and is often very pruritic. Skin biopsy will reveal deposits of amyloid in the subepidermal zone. This type of amyloid is formed from disintegrating keratinocytes that produce beta-pleated sheets of keratin fibrils that are deposited subepidermally and induce pruritus. Pityriasis versicolor may be localised to the groins and is associated with a fine scale. Skin scraping or biopsy will reveal characteristic grouped spores and short hyphal elements producing a ‘spaghetti and meatball pattern’. Erythrasma is the correct diagnosis in this case. 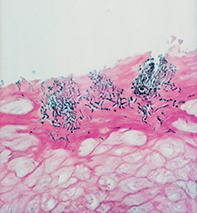 A superficial shave biopsy demonstrated rod-like bacilli forming ‘Chinese letters’ in the stratum corneum (Figure 2). This reflects Corynebacterium minutissimum colonisation of the skin. The organism can also be detected by screening the skin with a Wood’s UV lamp, which produces a coral pink fluorescence that highlight the bacterial colonies. Erythrasma may be treated with topical antibiotics such as erythromycin gel or clindamycin lotion. Systemic erythromycin or clarithromycin is also effective. Hyperpigmentation of the groins may be produced by Corynebacterium species colonising the stratum corneum and is easily screened with a Wood’s UV light. This article was first published in Medicine Today in July 2003. It was reviewed and updated in November 2012.